Soompi picked up a story that has made headlines in the Korean media. Jang Keun Suk, as he did in Daebak, went all out to fulfill his role roles in Switch. In Daebak, JKS performed all the difficult tasks himself, from being shot, dropping over a cliff, getting buried in mud, and eating a live viper. His eating the live - as in living - snake was often compared in the media to Leonardo DiCaprio's eating a bear's heart in ‘The Revenant’. Now, Jang Keun Suk has again chosen to perform his own stunts in Switch. Refusing a stunt double, JKS spent hours in the water, in February, taping the lead in to his Beak Joon Soo role. You have to admire an actor brave enough to refuse to a stunt double and willing to suffer all the consequences to his health to get the scene exactly right. That's a real actor! 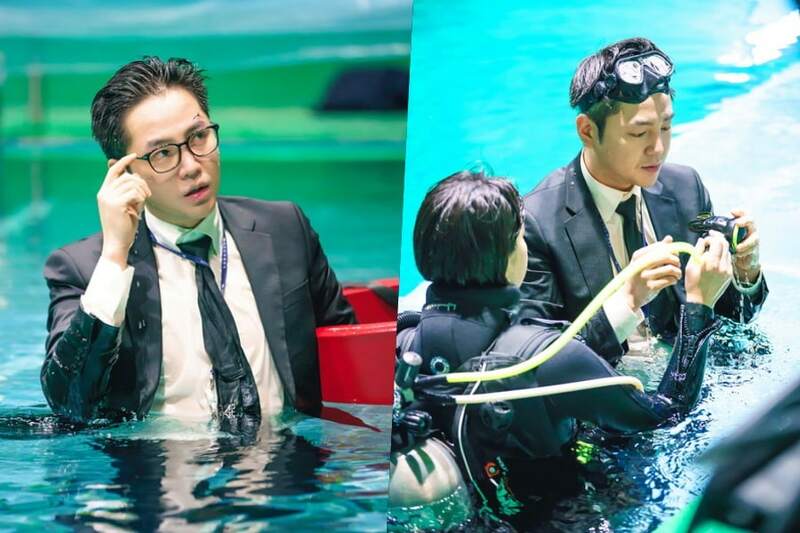 SBS’s “Switch” has shared new behind-the-scenes stills of Jang Geun Suk’s harrowing underwater scenes. The SBS Wednesday-Thursday drama premiered on March 28 and had the highest viewership ratings in its time slot for the first two days that the drama was on air. Jang Geun Suk especially captivated viewers during the premiere as he took on two roles of genius conman Sa Do Chan and by-the-book prosecutor Baek Joon Soo. The scene that stood out was when the henchmen of Geum Tae Woong (played by Jung Woong in) caused Baek Joon Soo’s car to careen off the road. A tense scene followed in which Baek Joon Soo attempted to get out of his car as it began to sink. The production staff had nothing but praise for Jang Geun Suk, who filmed the scene across three hours at an underwater studio. They stated that he was nervous at first because it was his first underwater scene in over 10 years and it was a difficult scene to execute. The staff worked with Jang Geun Suk to check every movement to make sure that they could finish filming the scene safely. Despite his body temperature falling from being in water for an extended period of time, Jang Geun Suk pushed forward and filmed all of his scenes without a stunt double. “Switch” tells the story of a genius conman pretending to be a prosecutor who looks just like him in order to take on the evils of society. The next episodes will air on April 4 at 10 p.m. KST. Check out the latest episode below!